We recently had the opportunity to meet up with homeschool friends for an adventure in the Florida Everglades. It was an incredible experience at Shark Valley where we joined them for a tram tour through the famed River of Grass. The various species of birds were plentiful, but when one hears about the “Everglades”, you cannot help but to think of alligators. We saw plenty of alligators. Now, we live on the water in Southwest Florida. We are in an area where the mouth of a large river dumps out into the harbor, then leads out to the Gulf. The water behind the house contains both fresh water species and mostly salt water species of fish. You will hear that alligators live in fresh water. Alligators also live in brackish, salty water. Brackish water is where the salt and fresh water of rivers and ocean/gulf combine. There is no sign or directions telling the alligators not to swim or explore the salt water. They are resilient creatures, and they go where they want to go. We have seen them swim up to the beach. That doesn’t happen terribly often, usually after there has been a lot of rain. If the rivers are running high, the alligators will venture out, even to through the harbor and around to the beaches. 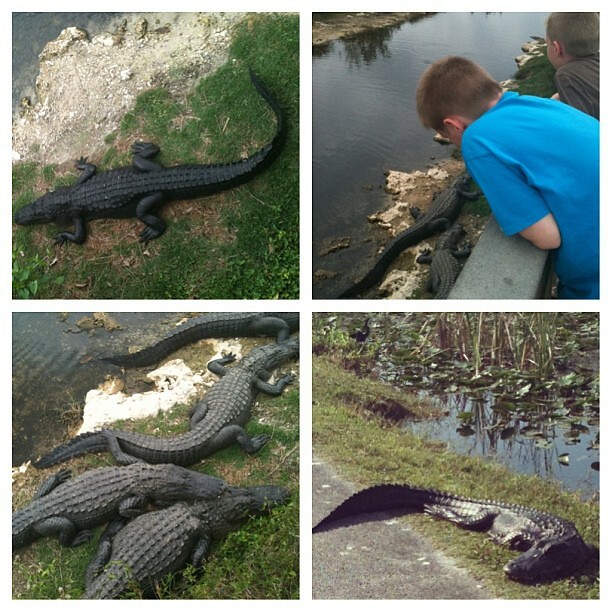 Although our boys have seen plenty of alligators, they were amazed to see them as plentiful as they did at Shark Valley and at the visitor’s center where we stopped between here and there. It was a wild experience. Once on the brink of extinction, the American alligator is now thriving in the southeastern United States wetlands. The average male alligator is between 10 – 15 feet long, but has been known to grow over 19 feet long. The female rarely grows more than 10 feet long. Alligators are only native in the United States, and China. The holes they dig are important to the environment providing shelter for many animals and increase diversity among plant life. They are considered to be “caretakers” of the Everglades because of the important roll they play in the ecosystem. An alligator is capable of making quick bursts of speed on land, but moves best in the water. They will come out of the water to sun themselves, build nests, and to grab prey. They drag their prey back into the water, holding it under water in a “death roll” until it drowns. It is important to never feed alligators, which leads to them losing any fear of humans or to associate humans with food. It is illegal to feed them because it causes them to become more dangerous to humans. You can learn more about alligators here, and listen to bellows. There is information about the theory of evolution, as it is a secular site – but full of otherwise good information on the alligator. I use it as an opportunity to point out that many other people do not believe in our Creator and an opportunity to discuss why that is and why we believe differently. Please use with discretion. Very interesting and exciting post! Why do they call it "Shark Valley"?